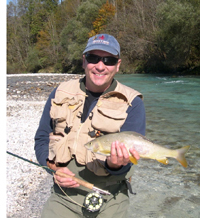 Courtesy photo Local fly fishing guide Ewald Grabher will talk about fly fishing on the Soca River in Slovenia at the next meeting of the Hemingway Chapter of Trout Unlimited. The meeting is set for 5-7 p.m. Thursday at Whiskey Jacques’ Restaurant & Nightclub in Ketchum. The Hemingway Chapter of Trout Unlimited kicks off its monthly meetings this Thursday with a presentation on fly fishing in Slovenia. Grabher grew up in the western part of Austria, but has been visiting Idaho and Sun Valley since 1981, having family here that immigrated in the early 1960s. He became a full-time resident in 2001 after he met his wife, Kelly. Grabher still owns a fishing tackle distribution business in Austria and returns there for business once a year, making sure some days of fly fishing are included in his trip. Grabher is also a fly fishing guide for Silver Creek Outfitters. The meeting will be held from 5-7 p.m. at Whiskey Jacques’ Restaurant & Nightclub at 251 North Main St. in Ketchum. The public is invited and admission is free. Trout Unlimited holds monthly meetings the first Thursday of each month from September through May.